It's Sunday, which means I'm back in the kitchen! This time I tried out a more substantive dish, a recipe that Food Heaven Made Easy calls, simply, "Poaced Eggs in Tomato Sauce". Apparently this is supposed to be a simplified version of a Tunisian dish by the name of Shakshouka. The only change I made to this dish was adding mushrooms, since 1) I anticipated that the dish might be too spicy for me on its own, 2) I had a bunch of unused mushrooms in my refrigerator 3) I just really like mushrooms. 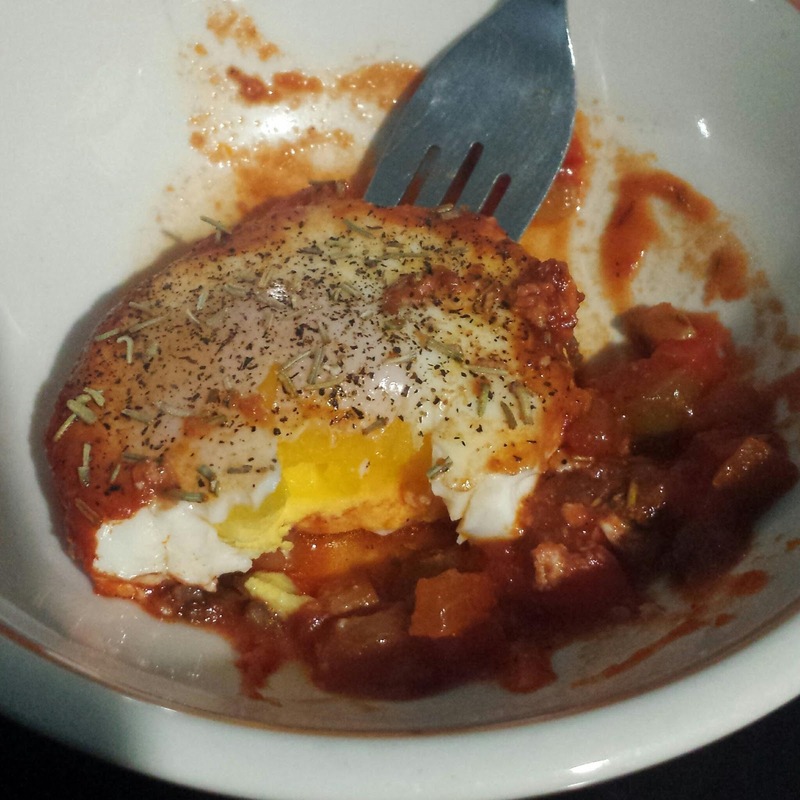 So here's how you make this version of Shakshouka. Chop up half of a red pepper, half of a jalapeno, and half of a red onion (and 3 mini bella mushrooms, in my case). Saute all of them together in olive oil for about 5 minutes, then add a cup (or slightly more) of tomato sauce. Let that cook for another 3-5 minutes. Then crack an egg into each of the four "corners" of the skillet. Cover and let simmer for 10 minutes. Add salt, pepper, and rosemary. Then gradually turn down/off heat so that the dish can stop bubbling and solidify. Serve and enjoy. Thanks, Food Heaven!